There’s no question about it: Center for Literacy changed Shaquanda Clemons’ life. She is one of seven kids, all of whom dropped out of high school. She didn’t like it, so she just left. Education wasn’t a priority when she was growing up, so no one pressured her to go back. About four years after she left high school, Shaquanda’s mom was working toward earning a GED® credential at Center for Literacy. 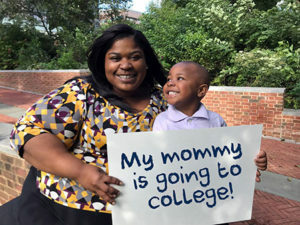 Her mom urged her to go to class with her. Ultimately, Shaquanda started taking classes. Center for Literacy was different. Unlike high school, where teachers could only focus on the trouble-makers, Center for Literacy was a mature learning environment. It was hands-on. It was personal. Her teacher helped her re-learn things—it was hard, but in 2011 she earned her GED® certificate in just six months. Shaquanda got a job at Center for Literacy at the front desk. She then started helping with data entry, and today she is proud to be the Senior Data Specialist at CFL. She attends Community College of Philadelphia. When she completes her associate degree, she will go on to Temple University. 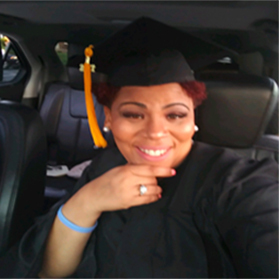 CFL has given her a great job and helped her family work towards their GED® credentials. What she is most thankful for is that CFL gave her the opportunity to give her son Caleb a future. At three years of age Emmanuel and his parents fled from violence in his birth country of Democratic Republic of Congo. He then stayed in Uganda for the next 17 years before settling in Pittsburgh in 2016. He arrived set on training for a career that would lead to stability and independence in his new homeland. Without a college degree Emmanuel had limited options, so he set out to accomplish the first step in his educational journey, earning a high school equivalency diploma. 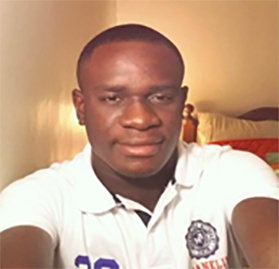 Citing a childhood desire and aptitude to “fix things,” Emmanuel dreamed of becoming an engineer. Entering Literacy Pittsburgh with this aspiration as his motivating force, he dedicated himself to accomplishing it. He and his teachers worked tirelessly inside and outside the classroom studying English and Social Studies, his toughest barriers to passing the GED® Tests. Staff assessed his progress with a variety of formal and informal assessments and advised him when they thought he was ready to take the tests. Additionally, a transitions manager worked to help him prepare for life after the GED tests by assisting with college and scholarship applications. Emmanuel’s dedication coupled with the support of a committed staff contributed to his passing the GED tests. Immediately after earning his high school equivalency he enrolled at the Community College of Allegheny County where he was awarded a prestigious scholarship. Not satisfied with his current accomplishments, Emmanuel eventually plans to earn a master’s degree in mechanical engineering. He undoubtedly will learn to make things so well they might never need to be fixed. “I passed math because of her,” relates Brooklyn native Joseph Gonzalez about his IU 13 Community Education instructor. Joseph needed to earn his High School Equivalency (HSE) diploma in order to move to the next step: become a union iron worker. After three years in prison and a lifetime of struggles, Joseph moved to Lancaster where his parole officer encouraged him to contact the Reentry Services office at Career Link. With the support of Reentry Services, Joe completed welding training at Thaddeus Stevens College of Technology. But to enter the union, he needed to earn his high school equivalency (HSE) diploma. The reentry office connected Joe with IU 13’s Community Education program, where he studied for five months with his IU 13 instructor in the Improved Reentry Education (IRE) program and earned his HSE. Joe joined the union and became a certified welder. Refugees from the Congo, Miguel Ikomo and his family arrived in the US a year ago through the support of Church World Service. He knew he needed to earn a high school equivalency degree first, which he accomplished in 5 months. “I was really driven to improve my English to get ready for college. 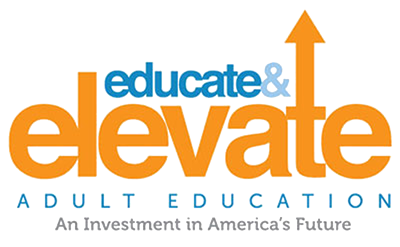 I didn’t want to waste much time,” explains Miguel about his enrollment in IU 13 Community Education’s Academic English program through Immerse International in Millersville. There, he practiced the four language skills of listening, speaking, reading, and writing as well as grammar and vocabulary development. “We did great stuff, like discussions, which is really common in colleges so it gets you ready for college assignments. It was great.” Upon conclusion of the semester program, Miguel began applying to colleges where he hopes to study computer science and play soccer. Teenage mother. School expulsion. Prison time. These roadblocks, and more, slowed down Natasha Khaliq’s dreams, but did not stop her. Today, at the age of 37, she has been accepted to Lancaster County Career and Technology Center (LCCTC) for Licensed Practical Nursing (LPN) training–her dream since she was 15. Enrolling at LCCTC first required that Natasha earn a high school equivalency (HSE) diploma, which she did after five months of tutoring through IU 13 Community Education’s Improved Reentry Education (IRE) program at Career Link. (In 2013, Natasha had been one subject test away from earning her HSE when the GED test changed, forcing her to start over again). Working with her IU13 instructor, she also learned about career and training options, so that on the Monday after Natasha earned her HSE, she knew her next steps and enrolled in Community Education’s Pre-LPN classes. There, she learned the skills and knowledge necessary to pass LCCTC’s nursing entrance exam (Test of Essential Academic Skills) in May 2017 and register for the 18-month training program. A conversation with his parole officer led William to Lancaster’s Career Link where he earned his GED through the IU13 Community Education Program just two weeks later. He next enrolled as a full-time student in Lancaster County Career and Technology’s (LCCTC) welding program where his tuition was funded by IU 13’s Improved Re-entry Education grant. After one month of school, he was offered a co-op—he works as a welder in a manufacturing company every day and goes to school for five hours twice a week after work. In the meantime, William became a celebrity when LCCTC photographed him while in training and used the picture on billboards to advertise their welding program. Greg dropped out of high school the first chance he could. Taking and selling drugs, Greg’s life was one dedicated to crime and eventually turned into one inside a prison. Then one day he caught his reflection in a mirror and realized that if he continued on his current path, he would end up back in prison. It was at this point where he decided he no longer wanted to live a life that was “cheap,” and he came to the Lifelong Learning Center. Greg Zucatti came into our program after 4 previous unsuccessful attempts of enrolling in a high school equivalency preparation program. He believes that if his instructors had been his teachers in high school, he would have thought twice before dropping out at the earliest possible chance. He was able to build a strong rapport with his GED® instructors, saying that his instructors’ upbeat positive attitude was contagious and made learning fun. They were thorough with their explanation and adjusted the pace according to his needs. He oriented into the program in January 2017 testing at an 8th GE reading level, 6th GE math level, and 7th GE language level. 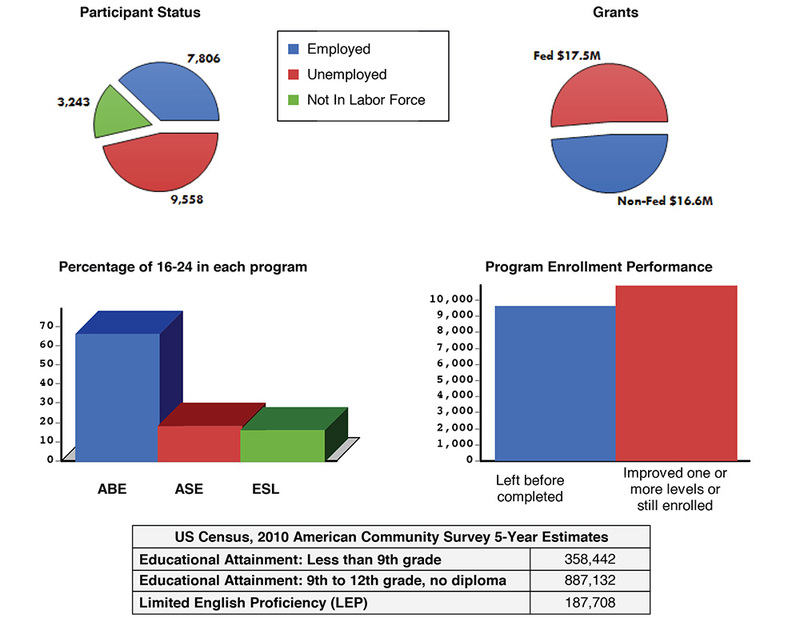 Upon his successful completion of the high school equivalency diploma, all his reading, math, and language levels went up to that of low adult secondary/ high adult secondary levels, achieving a 12.1 in language. Greg also has successfully entered the workforce and is considering applying to Penn State Schuylkill to earn his associates degree in business management.